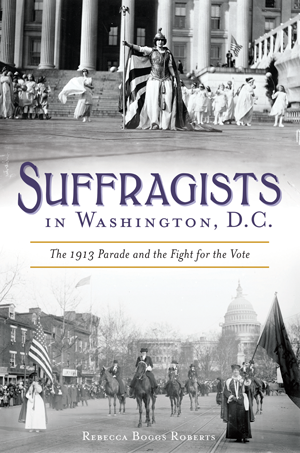 The Great Suffrage Parade was the first civil rights march to use the nation's capital as a backdrop. Despite sixty years of relentless campaigning by suffrage organizations, by 1913 only six states allowed women to vote. Then Alice Paul came to Washington, D.C. She planned a grand spectacle on Pennsylvania Avenue on the day before Woodrow Wilson's inauguration—marking the beginning of a more aggressive strategy on the part of the women's suffrage movement. Groups of women protested and picketed outside the White House, and some were thrown into jail. Newspapers across the nation covered their activities. These tactics finally led to the ratification of the Nineteenth Amendment in 1920. Author Rebecca Boggs Roberts narrates the heroic struggle of Alice Paul and the National Woman's Party as they worked to earn the vote.